You must buy at least $250 worth of pool fencing in order to rent this kit. DIYPoolFence.com is offering an exclusive promotion: purchase $500 worth of Visi Guard pool fence and receive this drill, drill bit and drilling guide for one weekend absolutely FREE. It is even added to your shopping cart automatically! If your pool fence order is under $500, you can elect to add the drill / drill bit / drilling guide rental tool to your order for only $10.00 per weekend! This unique tool guides you as you drill to achieve the correct drilling angle. *Please note: if you are trying to schedule time for installing the fence please inquire as to the availability of the rental as during the busy season the fence may ship before a rental is available. What makes the Swift-Set Drill guide different? 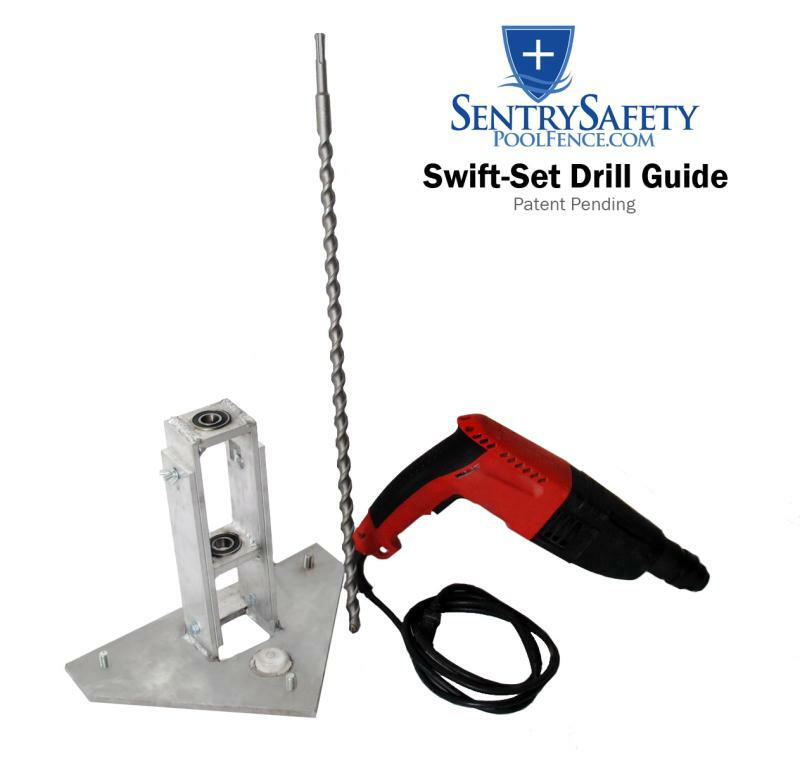 The Swift-Set drill guide is a patent pending creation by Sentry Safety pool fence. There are other guides by other companies that hold the drill bit at the correct angle the same as this guide. However because of the unique angle setting configurations on the sides changing angles can be done without removing the drill bit from the guide! The largest complaint previously about drill guides was having to remove the bit form the drill chuck, remove the bit from the guide, change the angle and put it all back together again for one hole to be drilled. Alternatively we previously also used a drill with an angle finder on the side for quick progress through angle changing however some customers have felt more comfortable with a jog holding the angle for them. This drill guide is the best of both worlds. Why is this drilling guide helpful? Not only are you getting a drill and drill bit from us but you are getting the Swift-Set drill guide. You will have all the tools you need in one set to drill the holes and drill them at the correct angle. The guide has a bubble level on the base. First step is to level the base on the pool deck. When you are ready to drill find your angle for that particular hole by moving the bolts on the side to the proper setting. Should I buy any extra bits? This all depends on your concrete and the amount of fence you have to install. In Florida the concrete is usually softer and the bits will last for around 100 feet of fence. However in some northern states the bits will begin to wear after 60 feet of fence. If you purchase an extra bit and do not use it we will give you a full refund on the price of the bit if you send it back with the rental. When will I receive rental and how long do I have it for? In most cases the alignment tool ships same time as your pool fence (otherwise you will be notified regarding a delay due to stock). Your rental period begins the day of receipt of the rental from UPS and lasts through the immediate following weekend. Each rental comes with a pre-paid UPS label for quick and easy return. All you have to do is carefully package the drill alignment tool and affix the box with the provided return label and promptly drop off at a nearby UPS store. Or call for local pick-up (pick-up typically has associated fees). I am buying my fence now but want to delay tool rental, how should I let you know? After placing the order call in or e-mail us: Sales@DIYPoolFence.com to let us know. Don't wait too long though, we try to get everything out as quickly as possible. *The tool rental is reserved for DIYPoolFence.com customers only. It is far below regular retail rental rates and cannot be extended to non-fence customers.